Seeing the amazing wildlife on a safari through the Ngorongoro and Serengeti parks in Tanzania is indescribable for me. I can only wish that many others have the same privilege to visit here someday. Off-roading in Toyota Landcruisers we had lions stroll up to us. We saw giraffes high above us. We saw the spots of cheetahs and the grandeur of elephants. We saw the wonder of endless streams of wildebeests migrating north to Kenya. years to perfect. Each creature has its own role. The zebras eat the high grass, the wildebeests the low part of the grass, and the warthogs the roots. The Lions hunt and eat the meats, the hyenas love the carcass and the bones, and the vultures are satisfied with the rest. Many much more talented writers have written about this circle of life. But to actually observe it firsthand exceeded all my expectations. The safari made me think about my business experiences as well. The ecosystem of business is obvious whether thinking about a manufacturing supply chain or in financing a house. As an entrepreneur, I’ve looked for under-serviced niches within the technology ecosystem. Then, I needed to adopt (execute) better and faster than my competition until I was accepted into the environment. That means my company provided enough niche value to be sustained in the ecosystem. I think if entrepreneurs looked at their businesses more in the context of the overall business ecosystem, they would develop better targeted strategies with more realistic expectations. Mother nature, like the business environment, is very efficient in eliminating the irrelevant within its ecosystem. The difference, however, is that the business ecosystem evolves in nanoseconds relatively compared to mother nature. Lion sightings on our safari. The king of the jungle ecosystem. 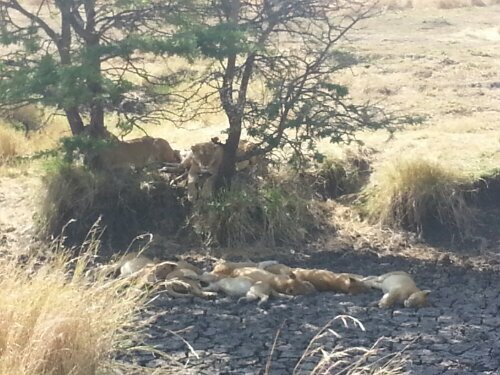 Posted in Company building and tagged business ecosystem, Ngorongoro, safari, Serengeti. Bookmark the permalink.